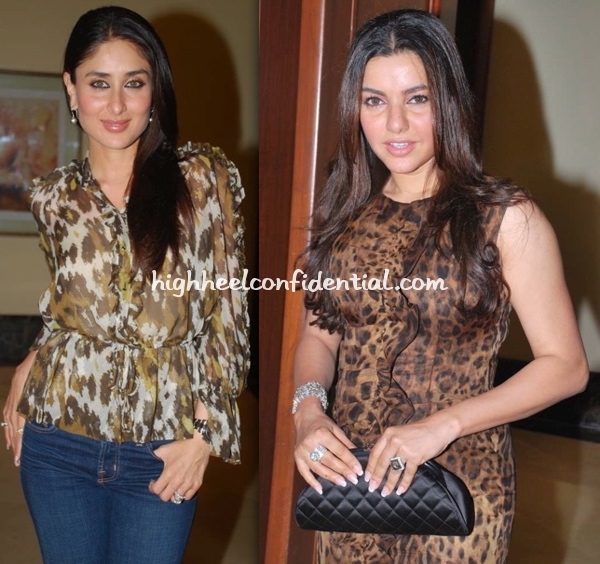 Ladies who played sisters on screen, whether intentionally or not, showed up in animal print at their movie’s ‘success’ bash! While Kareena went with a Cavalli’esque top, Kaykashan chose a Dolce and Gabanna dress, version of which that was also seen on Malaika and Shilpa previously! Which socialite wears her spots better? Earlier this month we spotted Raveena Tandon carrying an animal print bag, and neither her choice of clothes nor her choice of bag did anything for us! But having seen her at a recent party (below,right) got to say she finally got her animal print right, and looks great!